August | 2016 | Can Men Cook? OK – two stage move to the Cotswolds. Currently, staying in Cheltenham. And enjoying some fine dining, and some good pub grub. We discovered The Royal, near the Church in the centre of Charlton Kings on our first night after moving – recommended by The Charlton Kings Hotel (we were B&B there). Very tired after the packing, we walked down, and quite frankly couldn’t begin to remember what we ate! Asleep at 9…but resolved to return. We did, then booked in for a ‘welcome to new home’ family and friends Sunday Lunch. Eight of us. One smaller person who can eat more than someone 10 times his age! And 7 adults. We all went for the Roasts – lamb, beef or pork. With Crackling. And extra gravy (M has to have extra gravy. At home, she always goes last, and finishes it after the same sentence “Everyone had gravy?” – followed swiftly by pouring and glugging sounds!). Let’s get this Sunday lunch stuff straight here. It is now the biggest service of the week in most places we go to. It does vary – from sad carvery, with frozen mixed veg, to pretty presentable, but obviously bought in, to the posh end where chef not only loves what goes out of her or his kitchen, but it always looks good when you get to see it. This is why you pay £5 a head or £20! 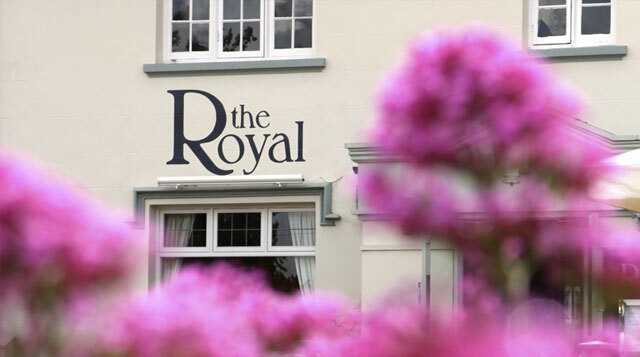 The Royal is not exorbitant in pricing, but is absolutely top end in style, food and ingredient quality and in presentation. What always makes a difference too are the staff. The kitchen is semi open. You can see and hear the hard work – but it is quiet. And the front of house team? Just love what they do, are attentive and modern interaction (not old fashioned obsequious and over humble). Leanne led the team on the day in our section. And they couldn’t have been better with us and with the little guy. Cant fault the place. Great for a drink or a full on 32nd anniversary meal (4 days after Sunday Lunch). Leanne said to someone else on the staff (I overheard…nosey person) “They were here Sunday…” Nothing more said – but they obviously want you to keep returning. And they used raspberry coulis to write a 32 on each of our pudding plates! Great team. great food. Lovely atmosphere. And yes, we will return! OK – we are moving house. And one of the many hard things to say goodbye to, from our home in Marlow, was to our local (actually, we pass three pubs to get to it!). 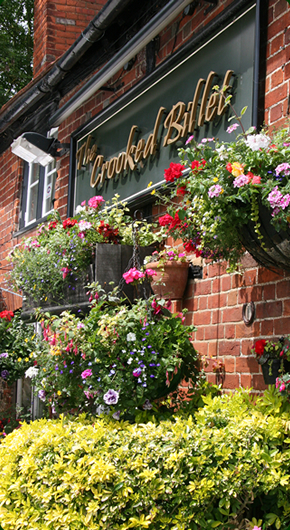 The Crooked Billet in Sheepridge Lane, between Little Marlow and Flackwell Heath. Our last Saturday evening was one of those special nights at the pub. They serve food 7 days a week at Lunchtime – evenings is for drinking. But they do have occasional food nights – special occasions, like Queens Jubilee, Valentines Day, Bank Holidays and the like. And, after a day at Ascot Races, the weary (and some squiffy!) coach riders arrive back for an evening of song entertainment and food. Anita and Bill Green have run the Billet for 30 years now. A 400 year old building, (Bill isn’t that old, but there are rumours…), one room pub, with an amazing award winning garden. Will that sort of landlord longevity ever happen in future? Will this sort of pub survive? Will we find an equivalent in Gloucestershire? I hope the answer is no, yes, yes, but suspect the last will be ‘no’. It’s just such a special place, from Bills jokes (and he can tell them many times, to a new audience every ten minutes…) to Anita’s super home cooking, solidly pub grub – from Chilli, to excellent Lasagne (this is an in joke), to Ham Egg and Chips to Turkey with Chips and Salad – one of my favourites. We had the English Curry with papadoms on the night – mild, and gorgeous. So we got up very early (5;30) raced through the final packing, and arrived at 2 pm, just after the last Sunday dinners were coming out (great value too – and really excellent beef and yorkshire puds, and all the usual roasties…). We were totally taken aback. The regulars had all signed a leaving card, and Bill had a framed photo of the pub for us to take away. It was quite emotional. And the memory will be cherished. And we will be visiting back often!